In what seems like another world, Richard Tawney supposedly quipped that a good historian ‘needs a stout pair of boots’. We’ve fallen a long way from that tree today. In today’s world of digital humanities and online journals, you can do perfectly good history without even leaving your study, let alone tramping the hills and valleys of the English countryside. So much stuff is online these days that some of us don’t even need to visit archives. For me, though, as wonderful as this online content is, historians still need to get out and explore the real thing once in a while. They need to dig deep into obscure manuscript collections in unglamorous archives; and they need to reconnect with their walking boots. Not just to avoid some dystopian future in which the world is plagued by a horde of blubbery historians who have wasted away as a result of their EEBO addiction. But mostly because it’s good history. A couple of days ago, I gave my own stout pair of boots a bit of a work-out. 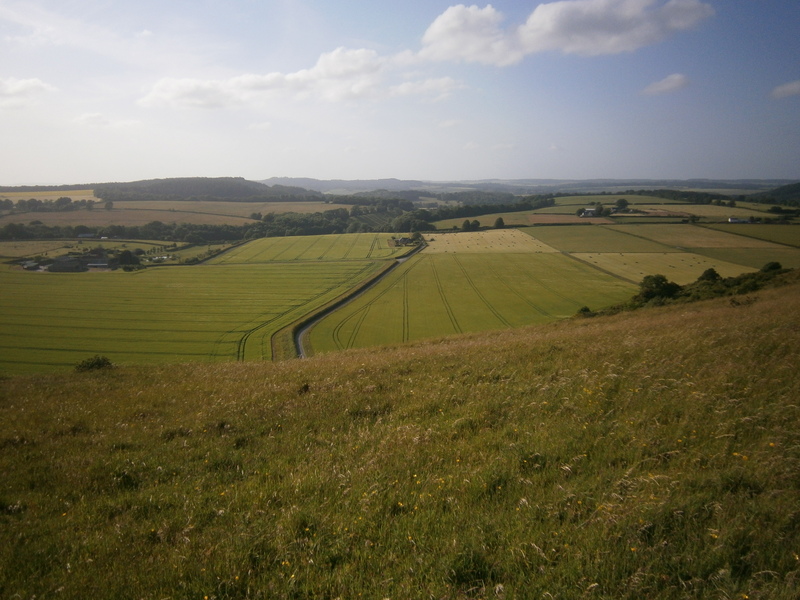 My aim was to get photos for some publicity leaflets for my department, but I also wanted to check out what looked like a fascinating historical landscape, namely the area at the western end of the Vale of Wardour and the top-left tip of Cranborne Chase. But I’d also set out with the specific purpose of looking at a couple of ditches. I realise this sounds mad. There are actually, in this world, people who go out ‘trig-point spotting’, but ditch-spotting is even weirder than that. But bear with me. These are interesting ditches, I promise. The first one, in fact, is properly a ‘dyke’. It crosses the crest of the chalk bulk of White Sheet Hill, a couple of miles south of Tisbury. 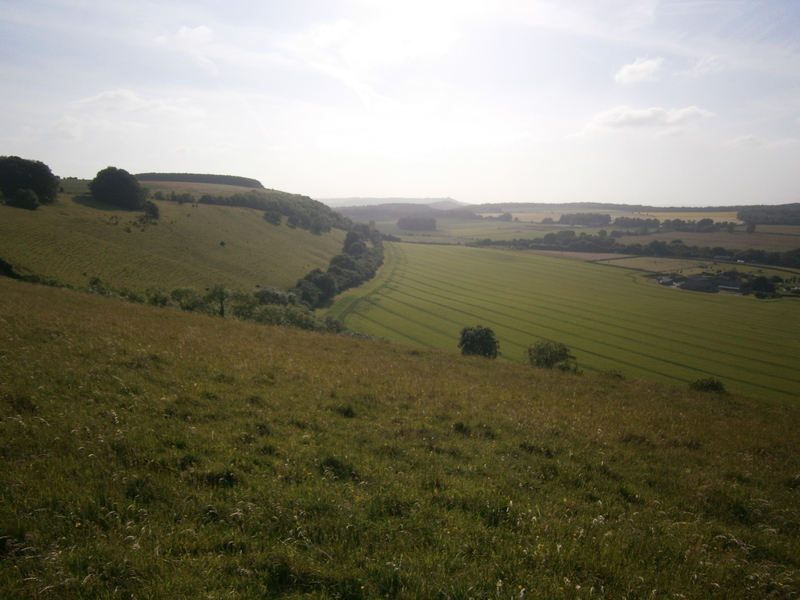 White Sheet Hill has quite a few interesting bits: it boasts pleasant views north and west over the Vale of Wardour and towards Alfred’s Tower, and south across the bottom end of the Chalke Valley. Apart from this, it has a decent long barrow, and a sturdy chalk track running along the ridge, which was the old Shaftesbury to Salisbury route, part of the main road between London and Exeter, actually turnpiked in the late eighteenth century, but superseded when the turnpike route migrated down the hill to what is now the A30. My ditch itself is a fairly prominent feature, large, unkempt, covered in nettles and overgrowth, running south-east at a right-angle from the old turnpike. But it’s also big. It was clearly a fairly significant landscape feature. And a look at the OS map reveals another crucial detail. It follows the parish boundary. Or, more properly, the parish boundary, specifically that between Berwick St John and Alvediston, follows it. Now, you have to be a bit careful with parish boundaries. Although many, perhaps most, parishes – particularly in the south – date back to before the Conquest, this is not always the case. Nor were their boundaries always fixed. Where two parishes shared a piece of common land (they ‘intercommoned’) the boundary between their two shares may not have been set out until Tudor or Stuart times, when parishes started to take on major civic responsibilities. One of the classic flashpoints was over which parish dealt with the body when a stranger died on the common. But there are some clues from this boundary, and this ditch, that we are looking at something very old. 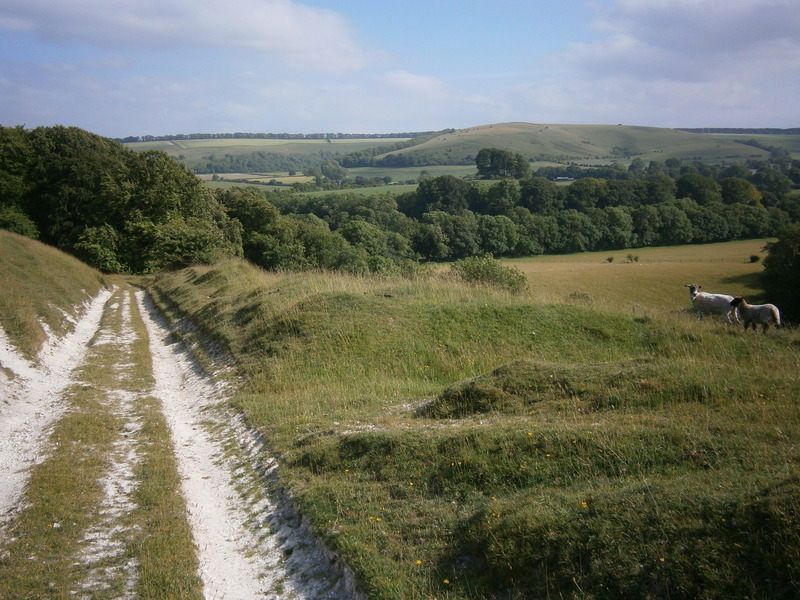 Firstly, downland southerners had tended to sort out their boundaries before those who lived in the country’s wilder parts. Dense population meant lots of neighbours, and good neighbours need good fences. Secondly, the parish boundary meanders. This may seem like an insignificant detail, but the point is that when early-modern folk came to settle boundaries between villages they either tended to follow the watershed – ‘as heaven water dealeth’, they would say – or they tended to draw a fairly straight line. Partly because it was often lawyers in London who set boundaries rather than people on the ground. Yet this boundary wanders about, scarcely touching the watershed, here zig-zagging for a bit, there staggering like a drunken insect who’d fallen in paint; sometimes following some natural feature, like the bottom of a dry valley, most of the time not. Thirdly, the ditch only exists on small stretches of the parish boundary. If this was a boundary marker, put there to keep the good folk of Berwick from annoying those of Alvesdiston, and vice versa, then we would expect the ditch to cover much if not most of the boundary. It doesn’t, and looking at the land there is no evidence that it was ploughed in the last few centuries. Finally, it just looks old. I’ve seen early-modern boundaries before, and they are usually fairly neat, this one is a tangled mess of earth and plant. If it reminds me of anything, it’s of the famous Wansdyke further north. Intriguingly enough, the boundary runs into small stretches of earthwork a couple more times as it runs south. Look on the OS map, and you can see a long dyke about half a mile south-east, at the bottom of Woodlands Down; then, on top of the escarpment near Pincombe Down, there is another small stretch of dyke where the boundary meets the ancient Ox Drove track. Now, we don’t necessarily know how old the parish boundary is. If one were to visit it, and find a light, thin, single-species, hedge – as we would expect from a modern boundary – then this would be strange. If, on the other hand, there is a thick hedge with lots of different plant species and perhaps even an earthen bank, then the chances are that we are looking at something pretty old. My money would be on the latter, but I’ll have to check next time I’m there. In fact, given the apparent relationship with the old ditches, which – say the Victoria County History – are indeed prehistoric, then I think we are looking at some link between the parish boundaries (which are probably Anglo-Saxon), and an earlier great estate. The dykes were probably markers of the boundaries of a fairly wealthy Bronze Age gentleman’s land, and – though we’ll never know his name – he has left us something through the ages in at least part of the modern parish boundaries. It’s an incredible thought just how old the stuff we take for granted in our countryside might be. I promised two ditches. My second, though, is much harder to notice. It’s on the OS map, but without that you’d be hard pressed to know it was there, even if you were looking straight at it. Again, this one is not really a ditch, but a pale, for it marks the boundary of what was once Wardour Castle deer park. The pales themselves are long gone, taken up during the Civil War for military purposes and never put back, but there is still the unmistakable line of a dyke. If you look very carefully. It’s covered in trees, mostly pines (which will be recent). In fact, the Wardour estate is – despite a stellar line-up of garden designers paying it their attention (including Capability Brown) – a mere shadow of its former self. If you want to see a historic garden in its full glory, you go to Stourhead just up the road. Part of Wardour Park from the Old Castle. And yet, Wardour is – in its own way – just as brilliant. Even the stunning ruined 14th century castle is but a fraction of the story. 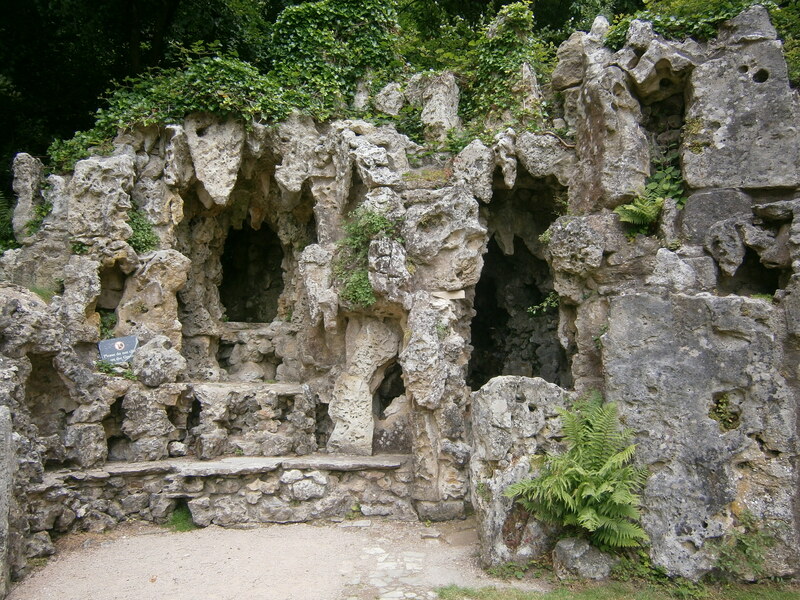 There’s the obligatory grotto, an ornamental dairy, a lake, an early nineteenth century ruined arch. 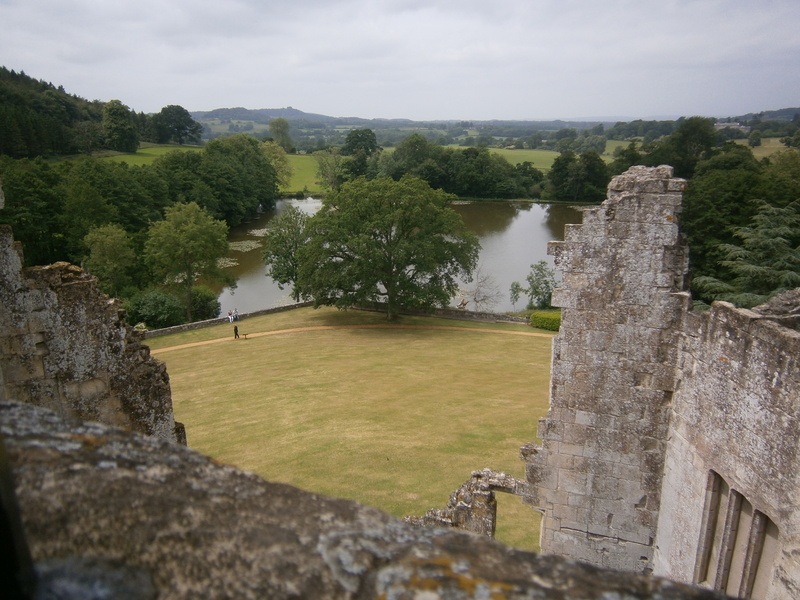 My favourite bit is the string of ponds to the west of the old castle. The immediate impression is of overgrown and natural lakes, complete with herons; but in reality these are the ghost of an old system of man-made ponds, perhaps medieval in origin and possibly for fishing, pleasure or both. 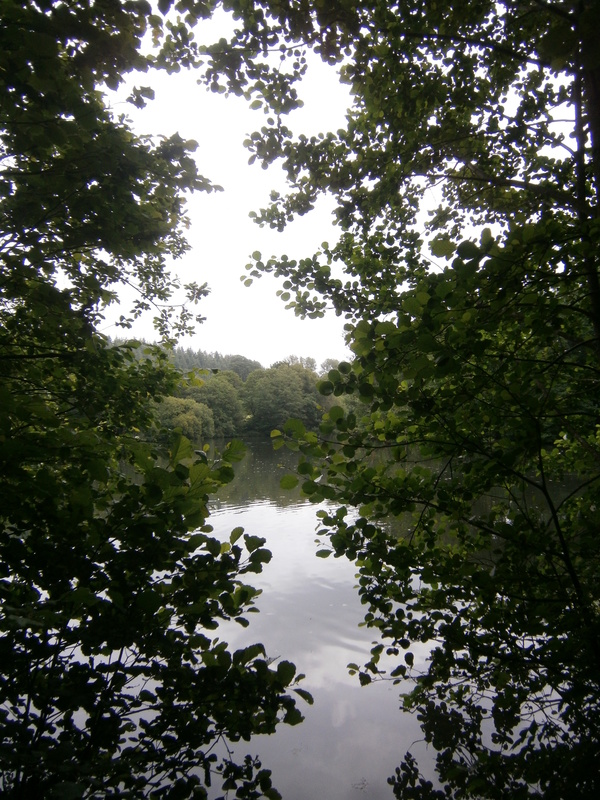 Pale Park Pond, Wardour Castle. Part of a system of man-made ponds, possibly medieval in origin. In such a rich, partly designed landscape, the park pale feels rather unassuming. But in its day it would have been major a symbol of power and wealth. The right to have a deer park was restricted to those with a specific royal licence, and only the nobility and higher clergy could get one, so this really was a big-ticket status symbol. Not for nothing did feuding aristocrats attack and kill each others’ deer; back then this was a serious affront. Interestingly enough, the pale also follows the parish boundary. So can we also deduce that it, too, is ancient? Alas not. It seems from surviving documentation that the boundary between Donhead St Andrew and Tisbury was uncertain right up until the seventeenth century, when it may well have been drawn up as part of a dispute over tithes. The earliest point that the boundary can be seen following its modern course is 1768-9, for which date there are maps. The deer park was, of course, much older than this, and it is quite possible that the boundary was settled on the pale as an acceptable boundary for all concerned, perhaps most of all because it followed an obvious and easily traceable path. So again the parish boundary seems to have been tacked on to an earlier earthwork, it’s just that this time it was happening much later. All of this is, of course, a great reminder that walking through our landscape is like wandering over the greatest historical document we have. Every ditch, corner, boundary, field, hedge, and every building and road gives us a little teasing hint of our past. Of course, we can’t fully understand these hints without reading books and manuscripts, but if we only use those then we miss out on the great treasury of the past that lies in the very land itself. All we need is to get off our laptops and go see it. Three cheers for ‘Two Ditches’ and its praise for the delights of landscape history. The productivity of that aimless wander…but the curious need not confine their joy to the countryside. Urban landscapes can offer just as much intrigue with their streetscapes, boundaries, empty parcels of land and revealing toponymy. Phases of construction are handily written into the fabric of most buildings. Even better, the quip about footwear doesn’t necessarily apply. The author is right. The record is there to be read in any landscape, and that’s basically wherever you happen to be. This is good history and furthermore, this can be good ‘citizen’ history given enough interpretive skills sharpened with experience. As Lifelong Learning co-ordinator for one of the few societies in the UK devoted to the subject, I thought ‘Two Ditches’ did the job of inspiring very well. Now who wouldn’t want to take a walk right through a historical document? Thanks! I have to admit to a preference for exploring the countryside (though only a slight one…) – but I’ll freely admit that there is just as much of interest in a town, even one we tend to consider not a ‘historic’ town.